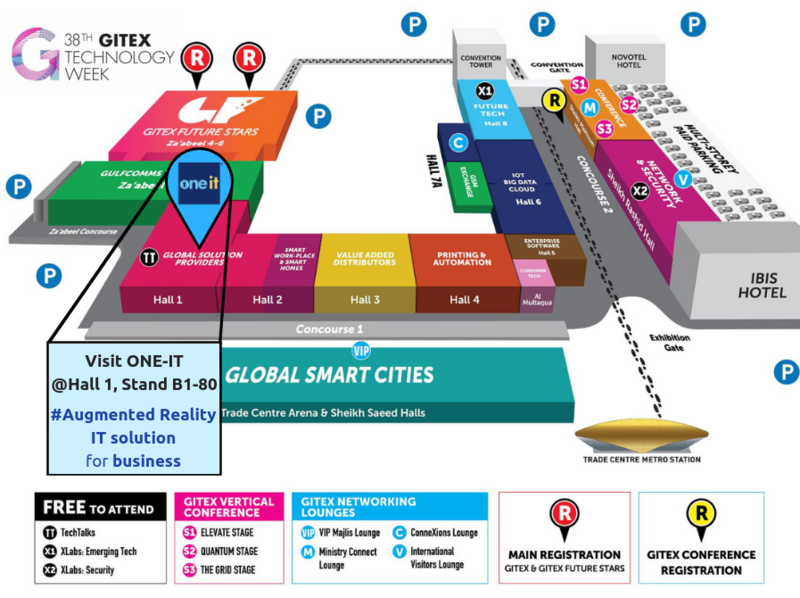 One-IT attends the GITEX Technology Week from October 14-18. Visit us at Hall 1, Stand no. B1-80! See below Gitex 2018 map of the event. ONE-IT is an IT company that offers a revolutionary system of integrated solutions and Smart Solutions based on Augmented Reality technology. #AugmentedReality (AR) is one of the technology trends this year. They offer a new way of interacting with customers, colleagues and the world around us. These latest AR technologies have enormous market potential and they are only in the initial stages of development for business productivity. At this event, One-IT will participate in the exhibition fair, where will introduce the 3 latest smart solutions, based on Augmented Reality technology. These solutions are Master OneAR, OneARchitect, and One Assistance. The solutions focus on taking companies to the next level, by reducing failures and increasing efficiency. This way, they will directly facilitate the workflows, and by providing smart training and assistance, they will make people work faster and more efficient. For 5 whole days, One-IT will exhibit these innovative solutions and show the efficiency of Augmented Reality solutions. Every company that wants to improve their workflow, to train their people by providing live assistance during their procedures, who want to give more value to their projects, will have the opportunity to find out more about these solutions and to see them in action. And Visit us at Hall 1, Stand no. B1-80! 0 Comments on "GITEX 2018 Map – DUBAI Word Trade Center – Technology Week in Dubai Oct 14-18, 2018"
We aim to develop and implement IT solutions to help the development and success of our customers because we know that our success builds on the success of our clients. One-IT certifications: ISO 9001:2015, 14001:2015, 27001:2013 quality & security standards.